Maritjen Keller (1732-1789) is #243 on my Ahnentafel List, my 5th great-grandmother, who married #242 Johann Ernst "John" Dafoe (1726-1784) in 1749, in Germantown, New York. The family of Conrad and Maria Barbara (Proper) Keller were well documented in the book by Lewis G. Proper, Proper Family History, Including Prooper, Propert, Propfer, Propper and Proppert (Rochester, N.Y. : the author, 1996). Marytjen Keller was the 4th child and second daughter of Conrad and Maria Barbara (Proper) Keller. She was born 27 March 1729 in Livingston, Columbia County, New York, and was baptized in the Loonenburg Church in Greene County, New York[1,3]. Marytjen married Johan Ernst Dafoe on 1 February 1749 in Germantown, Dutchess County, New York[1-2,5]. They settled first near Petersburg, New York, part of the Patent of the Manor of Rensselaerwyck, where John became a millwright and built both a house and grist mill on Dayfoot Creek in about 1753. The house still stands on the original foundation and one can see the mill site, part of the mill dam and mill pond outline on Dayfoot Creek. Between 1749 and 1769, Johan and Maritjen had eight children born in Germantown, Albany and Hoosick[1,2]. When illness broke out in the community, John, on a snowy winter night in 1767, moved his wife and family away, to Pownal, New York, now in Vermont. There he built another house and another gristmill on Washtub Creek, known now as Tub Creek, but this land was in the disputed New Hampshire Grants and John, supporting the right of the New York Rensselaerwyck land grant, was a British supporter. He spoke out against revolution and was jailed in Connecticut along with Governor William Franklin, son of Benjamin Franklin. 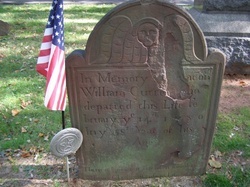 John and William escaped in 1777. John joined General John Burgoyne's army and fought as a Private in the Battle of Bennington, on 16 and 17 August 1777. Tragedy struck the Defoe family when John's eldest son, George, was wounded and died the day after the battle. John, with sons Abraham and John Jr., were captured and imprisoned. John again escaped, this time going to Quebec where he joined Roger's Rangers. John's wife, Mary Keller Defoe was at that time still in her home near Pownal. She continued to aid Loyalist recruiters and spies with a "safe house" where they could rest, receive information and food. She was evicted by the Rebels and arrived in Quebec under a flag of truce in 1781 along with her younger children, her sister-in-law, Eva Defoe Katzebach, and assorted relatives including two small granddaughters, the children of her dead son, George. In 1784, John fell ill and died in St. John's, Quebec, and was buried there. He died before he could receive a land grant. His wife, Mary, with her adult sons - Abraham, John, Jacob, Michael and Daniel, her married daughter, Mary Dafoe Rikely, and several grandchildren - came up the St. Lawrence River to Cataraqui Township #3, (Fredericksburg Township) where they all received land grants and settled. Another son, Conrad, settled with his regiment in Osnabruck Township. Marytjen died in Fredericksburgh in Upper Canada, and was buried there on 12 August 1789[2,4]. 1. Lewis G. Proper, Proper Family History, Including Prooper, Propert, Propfer, Propper and Proppert (Rochester, N.Y. : the author, 1996), page 2, Marytjen Keller birth and marriage information. 2. A Joan Lucas, "Captain John Ernst Dafoe UE,." 2015 United Empire Loyalists' Association, The Free Library (https://www.thefreelibrary.com/Captain+John+Ernst+Dafoe+UE.-a0416716781 : accessed 30 Mar. 2017). 3. "U.S. Dutch Reformed Church Records from Selected States, 1639-1989," digital images, Ancestry.com (http://www.ancestry.com), New York > New York City > New York City Lutheran, Vol. I, Book 85, page 191, Maria Keller baptism. 4. William Briggs, Ontario Historical Society Papers and Records (Toronto, Canada : Ontario Historical Society, 1899), page 60, Mary Dafoe burial entry. 5. "U.S. Dutch Reformed Church Records from Selected States, 1639-1989," digital images, Ancestry.com (http://www.ancestry.com), New York > Germantown > Germantown N.Y., Book 81, page 483, Johan Ernst Defuh and Maritgen Keller entry. Randy, thank you for the interesting and complex narrative. Thank you for some details on Maritjen's death. Keeping those pesky details straight is no easy task.